representation of math question. "9" represents the number enemies. The blue entities represent the available towers to choose from. There is a lot of educational game apps for teaching mathematics that can be found online. However, most of the games do not effectively incorporate mathematics content. Some games include math content as a secondary activity when it should be the main focus. Others insert math content that is separate from the game mechanics. Many games focus on recall of facts without letting the user reflect. Math may be perceived as an obstacle that gets in the way of doing more enjoyable activities. Unlike most math games that this app tries to incorporate math content in a tower defense type game. 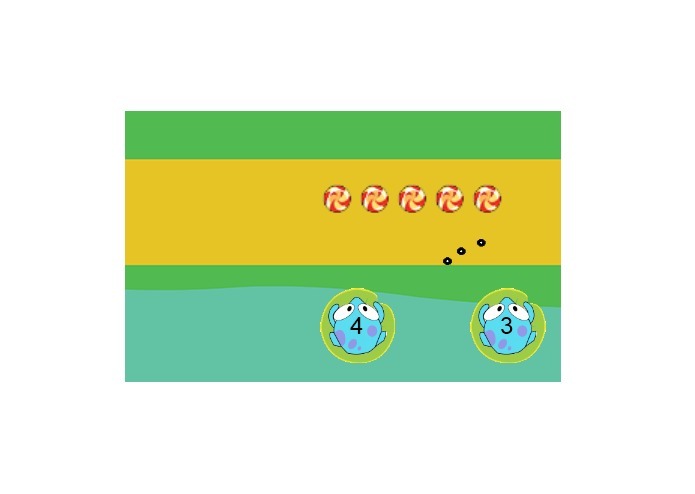 The goal of the game is same as other tower defense games: prevent the enemies from entering the player's territory. The mechanics of the game is slightly changed. The white square with a number indicates the number of enemies attacking. The blue entities are the pool of available towers that a player can choose. The green leaves are the bases which a player can place a tower. When the game starts, the player can see how many enemies are coming (white square with number). The player should then choose from a pool of towers (blue entities) and place them on bases (green leaves). Once the towers are set-up, the player should then click on the play button (on the bottom left corner) to start the wave. The player wins the level if no enemies survive. Math content is implicitly represented in the game. For example, the equation "9 - 4 - 5 = 0" can be represented in the game as: 9 as the number of enemies, -4 and -5 as the towers, and 0 as the number to reach. The game allows the player to see the problem first, create the solution, and test the solution. For example, in the game, a player sees a number of enemies coming. The player then needs to select from the pool of towers to prevent the enemies from attacking. 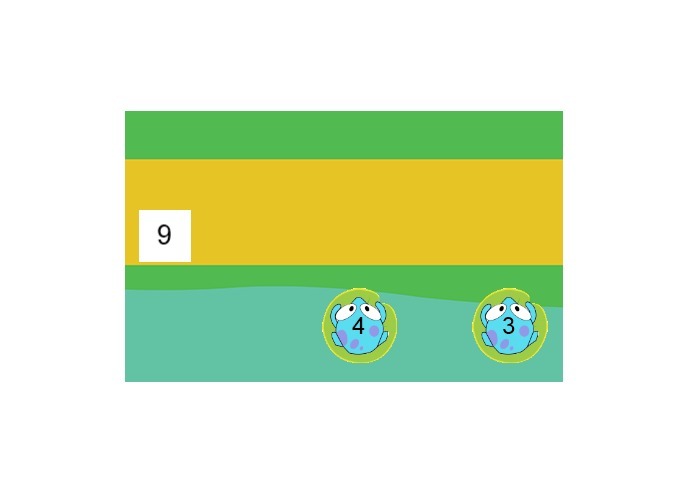 The player then checks if the solution is correct by clicking the play button. This encourages the players to analyze the problem, create a solution, and reflect. 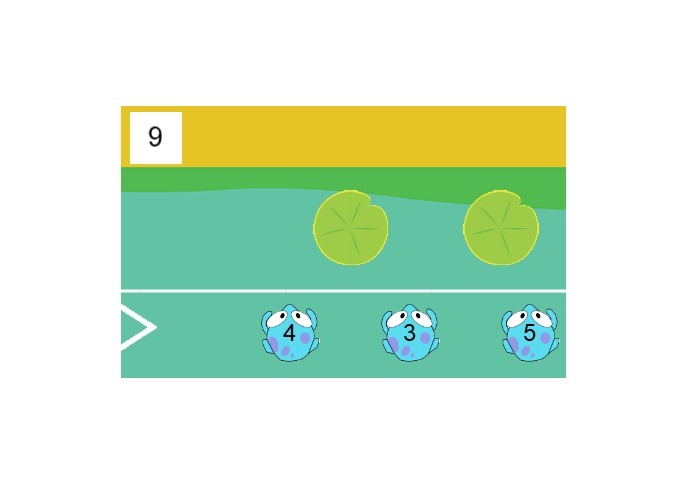 With the math content properly aligned in the mechanics, this game will potentially help children learn math. They may also discover some relationships in the game such as subtraction as an inverse of addition. Only subtraction was implemented in the game. Given sufficient resources, other basic operations such as addition, multiplication, division, and comparison will be implemented.